Millions of Americans remain vulnerable to surprise medical bills, and the lack of protection combined with increasingly narrow provider networks threaten to make the problem much worse, suggests new research from the USC Schaeffer Center and the Brookings Institution. The problem is so widespread and complex that a federal intervention will likely be needed, according to a paper published Thursday (10/13) by the Leonard D. Schaeffer Initiative for Innovation in Health Policy, a partnership between the Center for Health Policy at Brookings and the USC Schaeffer Center for Health Policy & Economics. In “Solving Surprise Medical Bills,” the authors advocated for “holding patients harmless” as the first step, and then developing non judicial approaches to resolving disputes between health plans and providers. One third of insured adults who report problems paying medical bills “say it is due to a surprise bill,” noted Leonard Schaeffer, trustee at Brookings and USC, in his opening remarks at a conference focused on the research held in Washington, D.C. The extent of the problem was underlined in the paper, which referenced studies showing the 21 percent of non-elderly adults have, at some time, received care at a hospital they thought was in network, but were billed by a non-covered physician. Numerous anecdotes of patients getting treatment at in-network hospitals but receiving large, surprise bills from out-of-network physicians has spurred “broad agreement to do something,” said Mark Hall, lead author of the paper and professor of law at Wake Forest University. A dozen states have already acted in some way to protect patients. California, for example, recently passed legislation limiting a patient’s financial exposure to no more than what would have been owed if the provider had been in network. The law takes effect next July 2017. But such laws have no effect on the 98 million Americans who get coverage from employers who self-insure. Federal regulations preempt state oversight in those cases. A comprehensive solution requires expansion of protections under the Affordable Care Act or Congressional action, Hall said. Among other measures, he suggested that provider rates should be regulated in surprise situations, or some form of process be mandated to resolve disputes between providers and health plans. Matt Fielder, chief economist at the Council of Economic Advisors, said the Obama Administration is moving under ACA authority to mitigate consumer exposure. Current out-of-pocket limits that apply to in network bills will also apply to out of network costs beginning in 2018 if patients were not prospectively notified that out of network providers would participate in their care. 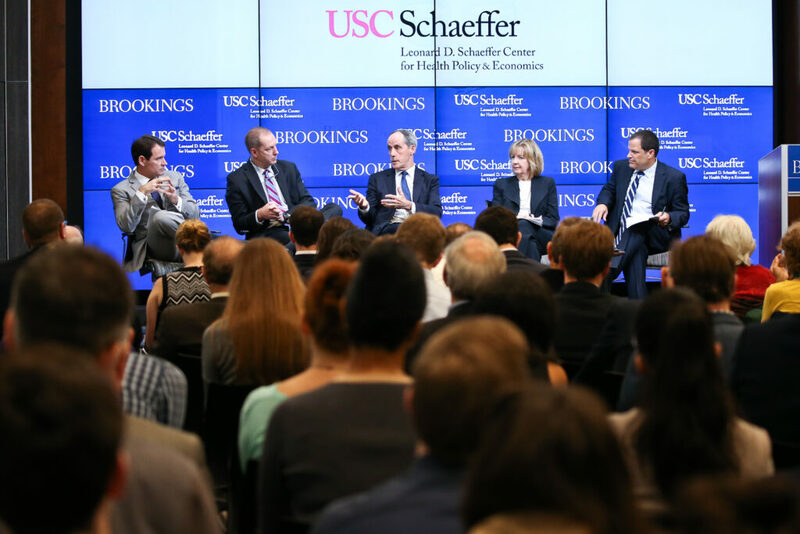 Despite a bipartisan consensus that action is needed, the difficulty of finding a way forward was illustrated by an exchange in a panel discussion led by Schaeffer Center director Dana Goldman. Colin Drozdowski, vice president for national provider solutions at Anthem Inc. contended that a small segment of physicians trying to “game the system” is causing the problem to grow “exponentially.” He noted that some surgeons who are under contract with a health plan will bring in a non-contract partner surgeon at the last minute to assist in the operating room. “It is not unusual to see a bill of $100,000 that under contract would be $5,000,” he said. Jeffrey Plagenhoef, president elect of the American Society of Anesthesiologists, countered that insurance companies are excluding physicians from contracts in their drive to narrow provider networks and are thereby creating gaps in coverage. “The problem really is the surprise that patients find in their insurance when need arises,” he said. The plans are too complicated, he said. “Only the insurance companies know” who is under contract and who isn’t. Tom Priselac, president and CEO at Cedars Sinai Medical Center in Los Angeles, said one third of the 2,000 physicians affiliated with Cedars are not aligned with network plans that contract with the hospital. Long term, more integration between hospitals and physicians will improve efficiencies and eliminate coverage gaps that cause surprises, he said. During a panel led by Schaeffer Center Director of Public Policy Paul Ginsburg, Yale assistant professor of health policy Zack Cooper agreed that hospitals are a key to helping patients avoid surprise bills. Hospitals should be required to sell services as a package, he said, so patients aren’t getting separate bills from the facility and from the doctors. Neeraj Sood, director of research at the Schaeffer Center, said Cooper’s suggestion would help, along with requiring health plans to be more responsible for disclosing who belongs to their networks. “We need to keep empowering consumers” to help drive down costs, he said. In the end, consumers have to be removed from the middle of disputes between payers and providers, said Elizabeth Imholtz, special projects director at Consumers Union. “Consumers should pay no more than in-network costs, and have any out-of-network billings count toward their deductibles,” she said. “And don’t require consumers to go to mediation” over surprise bills. The conference was held at the Brookings Institution. 150 individuals attended the event in person and another 500 individuals tuned into the live webcast.